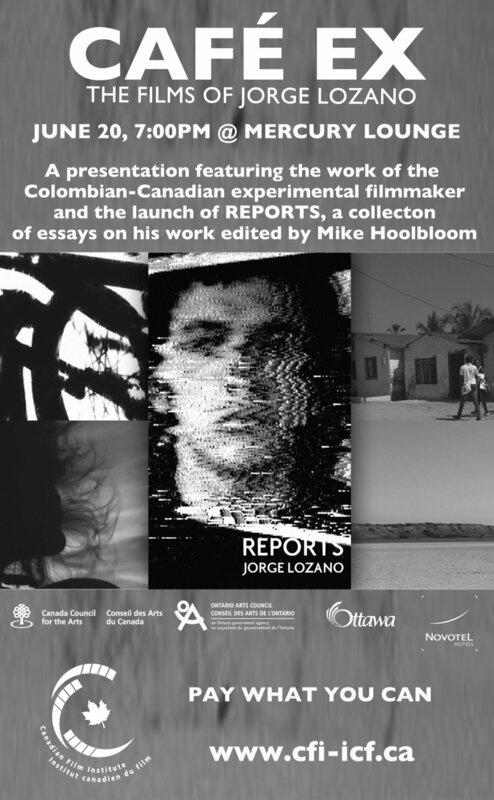 Screening and book launch of the new Canadian Film Institute/Pleasure Dome publication Jorge Lozano Reports, edited by Mike Hoolboom, designed by Alexandra Gelis, with contributions by many luminous writers. haze of coloured abstractions until at last the androgynous figure of Eve Mackey emerges on a rooftop, assertive and questioning. In this time capsule the artist offers his own work as found footage, as if he had many lives and selves, occupied multiple pasts and time zones. One of a pair of 16mm movies made with a crew (!) and actor familiars, this handsomely produced short brings a garage aesthetic to its gender-bending cast. Gaybashing, feminism, and white supremacy ravel out in a prescient political tract that is also a family drama and love story. even as paramilitary forces try to lock down territory and identity. A complex weave of personal and political, as if the body was already the body politic. /Illegal_its impact on the body/showcases a harrowingly eloquent quartet of illegal immigrants living in Toronto, Canada. Each works a variety of routinely underpaid jobs, including dishwasher, janitor, metal shop hack, construction crew. Chief amongst the economic precariat, they are routinely exploited for free labour (you mean I have to pay you?) and sexual services. In place of a talking head parade, the artist offers us a hallucinatory city portrait, each scene lensed as if from the vantage of a forbidden and alien presence, looking askance (sideways, the light streaking, hyperbolically coloured) at the neo-liberal showcase of this brave new city, remade in the image of its developers. Caf Ex: Inaugurated in 1998, this on-going visiting artist series presents artist-curated evenings of independent experimental film and video in the intimate atmosphere of Club SAW. The series features Canadian experimental cinema, with guest filmmakers presenting their work and engaging in extensive discussions with audience members for a "pay-what-you-can" admission.